Posted on June 1, 2018 at 11:48 pm. In today’s hyper-polarized world, complex issues often get lumped into simple, black-and-white perspectives. It’s either good, or it’s bad, with nothing in-between. So it is with the finishing protocols used for bison. In recent years, intense debate has emerged over livestock finishing methods. 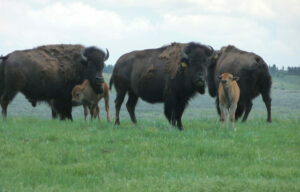 Most of that debate has centered on cattle, but it’s starting to spill over into the world of bison as well. Unfortunately, the debate has devolved into two simple, stark descriptions. 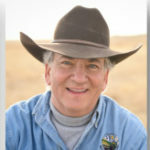 Many in the public today have the impression that livestock are either crammed into feedlots and stuffed with grain or are produced exclusively on wide-open pastures. The phrases “grain-fed” versus “grass-fed” have become shorthand for those viewpoints. Animals can be fed a grass-fed diet while in corrals or finishing facilities. Corn is a member of the grass family, so a grass-fed animal can graze in a field of green corn plants. The assumption that “grain-fed” includes a diet solely of corn is misleading because nearly all feed rations include a mixture of grains, including barley, oats, or wheat, along with alfalfa and other roughage. The equation is more complicated with bison because we are still learning about this animal under our care. For a start, the biology and undomesticated nature of bison make feeding and finishing bison more difficult than for most other ruminants. We also know that Mother Nature did a great job in perfecting this animal over thousands of years, so we need to be very careful in how we intervene. When our business sprouted a few decades ago, producers largely applied cattle industry feeding practices to finish their animals. Through the years, we learned that bison are unique, and that—while there are some similarities to cattle—there are many important differences. Today, finishing practices utilized by bison producers are as varied as the producers who utilize them. Decisions on finishing protocols are driven by a myriad of factors, including animal health, biological rhythms, consumer expectations, available land mass, species of available grasses and forage, climate, and more. Many ranchers throughout our industry are experimenting with new practices, and then sharing their knowledge with fellow bison producers. The world has gotten much more complex in the years since Menken penned those words. Yet, the desire for clear, simple (and wrong) answers perseveres. Building healthy herds, maintaining vibrant pastures, and producing a delicious, nutritious product is a complex process. Responsible bison ranchers know there is no clear, simple answer. The best answer will always be a work in progress.